Funded by the European Commission (EASME) with a total amount of the €1,980,188, EnergyWater project has a duration of three years (01/02/2016 – 31/01/2019). Need for comparison and ranking. The best way that a company can implement “something new” is after having the certainty that a similar company has solved a similar problem with this “something new”. Developing and implementing EnergyWater’s EMSA (Energy Management Self-Assessment) web-tool across Europe, companies can have a first picture about how this issue of energy efficiency is working in other companies regarding their current situation. Leadership of the Energy Angels. Objective and statistic data are always a good first argument to implement new solutions but this is not itself enough. The industrial sector needs trusted providers with proven experience that respond with solutions to specific problems. The Energy efficiency market is still not well developed from the providers’ side. There are thousands of companies offering energy efficiency solutions, but industrial companies still don’t know who is the correct one for its case. Need for energy audits based on common methodologies. It is necessary to help deliver the energy savings potential in certain market segments where energy audits are generally not offered commercially. This is why the EnergyWater project aims to generate a self-audit methodology for European manufacturing companies, which can be made available on a web-tool to tap energy saving potential in industrial processes. Requirement for open source tools to help share business experiences and to foster benchmarking and benchlearning. Although there are good methodologies targeting energy efficiency, companies do not take much advantage of these. An open web-tool that can be equipped with new content, opinions and best practices from end users can reach its target audiences more easily than a static manual. This is how EnergyWater’s EMSA (Energy Management Self-Assessment) web-tool will help by providing both information (self-energy audit with saving potentials) and expertise (best practice strategies and Εnergy Service Companies (ESCOs) providing services on energy efficiency). Energy Service Companies (ESCOs) will act as facilitators (technical and financial) for energy saving implementation. ESCOs play a key role both providing technical expertise on energy efficiency and facilitating access to finance. The Energy Angels network will improve the visibility and availability of skilled energy auditors and will connect energy efficiency investment projects with investors. Involvement of public authorities is important to catalyse impactful energy efficiency regulation. One of the main barriers to implementing energy efficiency measures is that European water and energy policies are not sufficiently integrated, resulting in neglecting interconnected effects. Furthermore, economic incentives to adopt efficient water and energy technologies are inadequate. There is a need to identify and remove regulatory and non‐regulatory barriers to the use of energy performance contracting and other third‐party financing arrangements for energy savings. Member States and regions should be encouraged to make full use of the Structural Funds and the Cohesion Fund to trigger investments in energy efficiency improvement measures. The project aims to develop a Policy Pathway for how governments can promote energy management in industry. EnergyWater project is the first step to improve the energy efficiency by developing the tools and the network to make the “energy efficiency” something real for manufacturing companies across Europe. Improve the competitiveness of the EU industrial sector by reducing 20% energy costs in industrial water processes. (WP4)A total reduction of 26 GWh/year will be achieved at the end of the project by implementing energy efficiency measures in the European manufacturing companies. Identify energy saving potentials and benchmark energy performance through an Energy Management Self-Assessment (EMSA) collaborative web-tool. (WP1 & WP2)Manufacturing industries can anonymously input their data into the EMSA web-tool to know their ranking regarding other industries with the same processes. Strengthen the energy saving market through the creation of an “Energy Angels” network: facilitating contacts with skilled energy managers and auditors and providing access to support for the implementation and financing of water energy efficiency projects. (WP3)The EnergyWater project will prepare the ground for investment by providing information about potential energy savings and establishing a network of qualified suppliers (with technical and financial skill).Furthermore, the Energy Angels network will implement a training module to improve the availability of skilled energy managers and auditors in which at least 200 people will be trained. Improve energy performance in industrial water processes through benchmarking activities and a best practice guide based on real life case studies. (WP4)Energy saving strategies identified in the EMSA web-tool will be implemented in manufacturing industries. The best energy saving strategies to manage industrial water processes will be compiled in a guidance document. Influence energy efficiency regulation through public authorities’ involvement. (WP4)In order to optimise energy efficiency in manufacturing industries, both private and public stakeholders have to be aware of their role. We will make public authorities part of the EnergyWater project with the objective to identify and remove regulatory and non-regulatory barriers to the use of energy performance contracting and other third-party financing arrangements for energy savings. Figure 1. Market barriers implementing energy efficiency in industries. Figure 2. Solutions proposed in the energywater proposal removing market barriers. One of the challenges of the EnergyWater Project is to improve the competitiveness of the EU industrial sector by reducing 20% energy costs in industrial water processes. Primary energy savings 26 GWh 78 GWh Energy Angels will play a key role implementing energy efficiency measures. Investments made 1.300.000 € 3.000.000 € Energy Angels in general and ESCOs in particular will implement energy efficiency investments in the manufacturing industries. Policy makers influenced 100 150 Meeting with policy makers will be organised for a better implementation of energy efficiency policies and support. Improved competitiveness: Energy savings in manufacturing companies will reduce production prices and increase competitiveness. Implementation of energy-efficiency policies: During the project execution many articles of the Directive 2012/27/EU on energy efficiency will be implemented such as: “Article 8. Energy audits and energy management systems”, “Article 16. Availability of qualification, accreditation and certification schemes”, “Article 17. Information and training” and “Article 18. Energy services” amongst others. 70 entities working on energy efficiency will be part of the Energy Angels network. 75 professionals trained on-line as energy managers. 125 Energy Angels trained as energy managers and energy auditors. Preparing the ground for investment by identifying energy saving potentials and creating an Energy Angels network as a catalyst for implementation and finance energy efficiency. Enabling policy: Meetings and workshops will take place with the objective of informing public authorities, policy makers and industrial stakeholders about the economic and environmental impacts of designing programmes, to encourage energy efficiency investments. 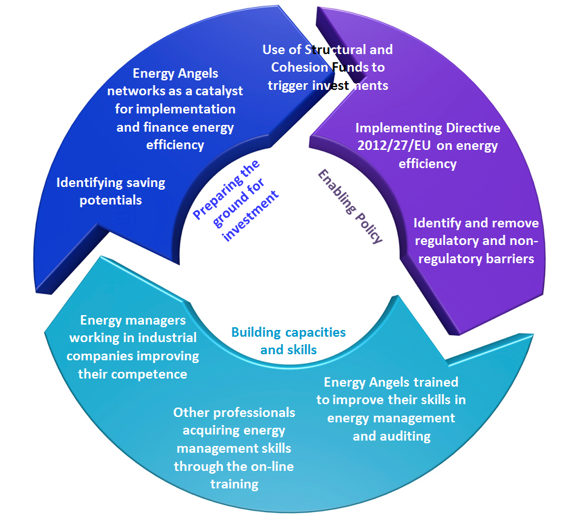 Building capacities and skills: Energy Angels trained to improve their skills in energy management and auditing, as well as other professionals acquiring energy management skills through the on-line training. The Energy Management Self-Assessment (EMSA) web-tool will be a free and anonymous ICT tool to compare and benchmark the energy performance in industrial water process in European manufacturing industries. As a result of the self‐assessment, the tool will provide guidelines with tailored measures to improve energy performance. The EMSA tool will be based on existing standards such as CAF (Common Assessment Framework), EVO (Efficiency Valuation Organization), ISO 50001 and The Carbon Trust Energy Management assessment tool. The Energy Angel network will improve the availability of skilled energy auditors and energy managers as well as suppliers and funders. The network will be composed of companies or individual professionals working in the field of energy efficiency (ESCOs, research centres, energy auditors, technology suppliers, etc.). The Energy Angels Network will advise on best practices and ways to use innovative technologies and will create links to strategic partners that can lead to project funding.